NEW YORK, June 29, 2018 – Improving the health and well-being for a worldwide population expected to swell to 8.5 billion people by 2030 is integral to each of the 17 United Nations Sustainable Development Goals (SDGs). 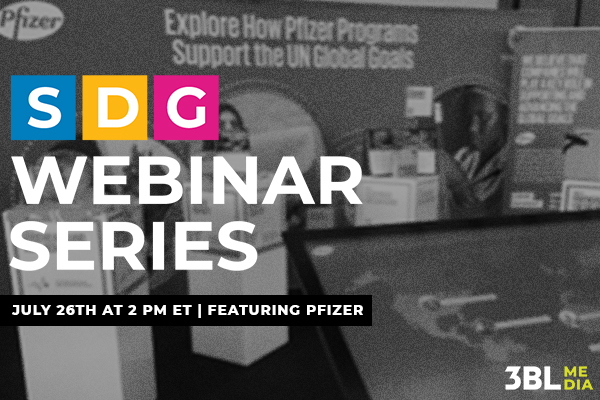 Pfizer Inc. will talk about its support of the SDGs in the second of 3BL Media’s new webcast series, “Aligning Business With the Global Goals,” July 26 at 2 p.m. ET. Attendance is free and open to corporate responsibility and sustainability professionals. Based in New York City, and reporting annual revenues of $52.5 billion, Pfizer uses the SDGs as a framework to communicate its work related to seven of the Global Goals – SDG 3, Good Health and Well-Being; SDG 5, Gender Equality; SDG 6, Clean Water and Sanitation; SDG 9, Industry, Innovation and Infrastructure; SDG 11, Sustainable Cities and Communities; SDG 12, Responsible Consumption and Production; and SDG 17, Partnership for the Goals. Presenting on “Aligning Business with the SDGs: Good Health and Well-Being With Pfizer,” will be Chris Gray, senior director, global institutions and public reporting, in Pfizer's Corporate Responsibility group. For background on Pfizer, review the 3BL Media profile page and the Pfizer 2017 Annual Review. 3BL Media is the world’s leading communications partner for purpose-driven organizations. Through content distribution, multi-media promotion and hands-on learning experiences, we connect organizations to an unrivaled audience that is passionate about sustainable business.